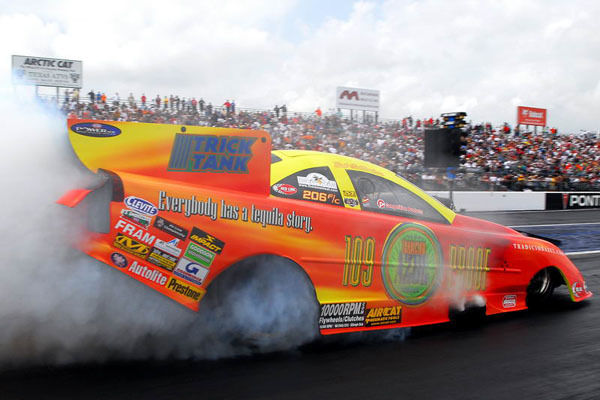 San Antonio --� Bob Gilbertson, owner/driver of the Tradicion Azul Tequila Knoll Gas Nitro Funny Car and his team are heading into this weekend's Live Nation IHRA Texas Nationals on a mission. Gilbertson, and his crew chief Nicky Boninfante Jr. are coming off a very successful start last weekend in Houston and are optimistically confident about their chances. "It's been a long time since I felt this good going into a race," Gilbertson said.� After our performance last week where we qualified well and ran three consecutive 4.9 second runs we've got some momentum on our side.� Since this is an eighth-mile race I looked our numbers from Houston and maybe we can even re-set the eighth-mile World Record but I'm not going think about that, I'm concentrating on my driving.� I know the guys will give me a car that I can win with, all I have to do is make sure the driver does his job.� The pressure is on me and my goal is to drive the Tradicion Azul Tequila car into victory lane." Boninfante has just one goal in San Antonio. "I want to win the race, that's it," Boninfante added.� "I don't care about anything else, numbers don't matter, my goal is to put the Tradicion Azul Tequila car in the winner's circle for the first time and leave with the points lead." HOUSTON --� Bob Gilbertson had one of the biggest weekends of his drag racing career at the NHRA Spring Nationals in Houston this past weekend. CHARLOTTE, N.C. (March 26, 2008) -- Jay Pennington, Managing Director of Extraodinario Brands, brand owner and importers of Tradicion Azul Tequila, announced that Tradicion Azul will join forces with Nitro Funny Car racer Bob Gilbertson starting at this weekend's O'Reilly Auto Parts NHRA Spring Nationals in Houston, Tex. CHARLOTTE, N.C. - Funny Car racer Bob Gilbertson announced that he's filed an entry for the O'Reilly NHRA Spring Nationals in Houston March 28-30 and will drive his new Trick Tank Monte Carlo to do battle with the best drivers out there for his first NHRA start of the year. EDMONTON Canada - Bob Gilbertson went into this past weekend's IHRA Rocky Mountain Nationals with the goal of being the No. 1 qualifier, setting the nitro Funny Car record and winning the race. Nitro Funny Car racer Bob Gilbertson is returning to a track that he last raced on 30 years ago, Castrol Raceway in Edmonton, Alberta Canada for this weekend's IHRA Rocky Mountain Nationals. Englishtown, prerace: Funny Car racer Bob Gilbertson is optimistically confident heading into this weekend's Pro Care Rx NHRA SuperNationals at New Jersey's famed Raceway Park and for good reasons. CHARLOTTE, N.C. - Bob Gilbertson, owner/driver of Terminator Motorsport's Autolite Spark Plugs/Prestone Antifreeze nitro Funny Car, announced that the very popular blue "Jungle Jim" tribute car that he debuted at the Englishtown race in 2003, will be on display at two different venues during the NHRA Super Nationals at Raceway Park June 21-24.